​8 a.m., 9:30 a.m. & 11 a.m.
Come Alive this Easter at Christ Community Church! Over 2,000 years ago, God's redemption plan altered the world. The power of sin and death was broken through the crucifixion of Jesus Christ that first Easter. Join us for a fresh start at Christ Community Church for our Easter services on April 21 at 8 a.m., 9:30 a.m. or 11:00 a.m! Childcare is provided. Please pre-register your child for Kingdom Kids here. Easter is a great opportunity to invite someone new to church! Join us on Thursday, April 11 and Monday, April 15 at 6:30 p.m. for neighborhood outreach and prayer surrounding our Easter services. ​Please register by contacting Pam Bone. Invite your neighbor! There are also outreach tools available at the LIVE Booth, so please take advantage of those materials. Also, if you would like to serve in the choir for the Easter Sunday performance, please contact Jodie Creswell. Rehearsals will be Thursday, April 11 and Tuesday, April 16 at 6:30 p.m. in the sanctuary. ​Easter Sunday is typically a very well-attended day for services. We ask that you keep in mind the safety of others when you are in the parking lot. 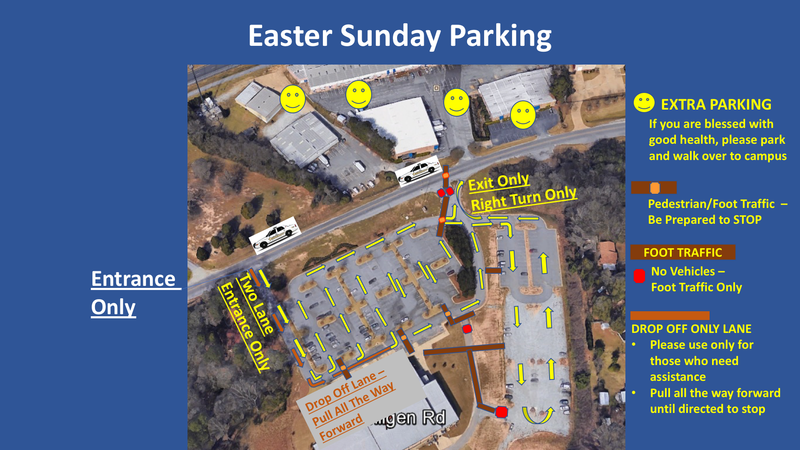 To see a visual of proper traffic flow and extra parking, click here.